The “PokerBrat” denies Mike Gorodinsky his second bracelet; further cements his legacy as the most successful player in WSOP history. Phil Hellmuth has once again proven why he is one of the greatest to ever play the game. On Monday, Hellmuth dominated the $10,000 Razz Championship final table to earn his record-extending 14th World Series of Poker bracelet. What is there to say about Hellmuth that hasn’t already been said? He first rose to fame in 1989, winning the $10,000 Main Event and denying Johnny Chan his third victory in a row. From that point on, Hellmuth consistently played against elite competition, time and time again dominating the game. Back in 2012 it was a question whether or not Hellmuth would ever win a bracelet in a non-hold’em event (each of his 11 prior bracelets had been in this discipline). Hellmuth silenced critics when he defeated Don Zewin heads up to win the $2,500 Seven Card Razz event. Now, two bracelets later, Hellmuth has once again proven himself to be one of the top razz players in the world. 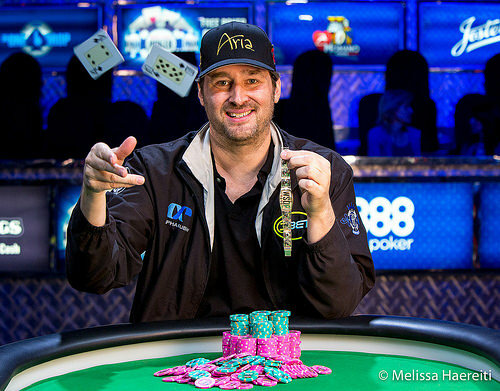 Hellmuth pocketed $271,105 for his championship victory. This brings his lifetime earnings at the WSOP to an astounding $12,783,905. Over the course of his career, Hellmuth has attained a record 109 cashes at the WSOP with 52 of those being final table appearances. 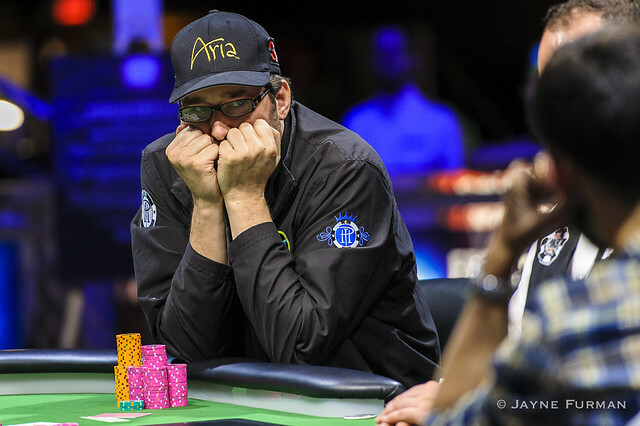 The whispers of a possible 14th bracelet for Hellmuth began on Day 2 when he surged to the top of the chip counts. He ultimately finished the day third in chips and was primed for a solid run heading into the final day of play. Hellmuth continued to extend his lead and at one point held half of the chips on the table during five-handed play. Hellmuth topped an absolutely stacked field of 103 total runners. 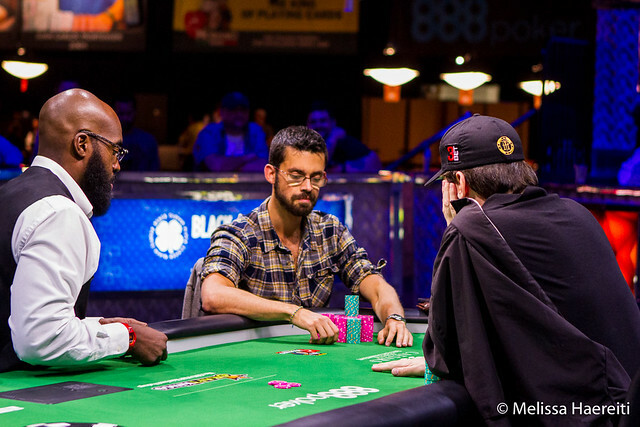 The final table included the likes of fellow bracelet winners Brandon Shack-Harris, Thomas “Thunder” Keller, and Mike Leah. 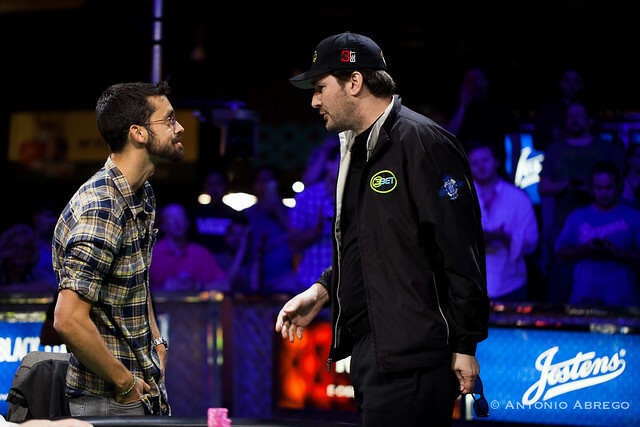 In the end, Hellmuth squared off against 2013 bracelet winner Mike Gorodinsky for the title. Hellmuth began the match with a chip deficit but quickly battled back into the chip lead. From there, the chips swung back and forth consistently with Gorodinsky all in for his tournament life several times. In the end, however, the “PokerBrat” was able to clinch the victory in heads up play. Despite this momentous occasion, Hellmuth immediately made it known to the world that this win was about more than just the glory. Hellmuth’s victory has now further padded his resume as the most successful player to ever grace the WSOP felt. Following this win, one thing is certain; while Hellmuth is surely celebrating his win, his quest for bracelet number 15 is right around the corner. Second Place: Mike Gorodinsky finished runner-up to Phil Hellmuth. 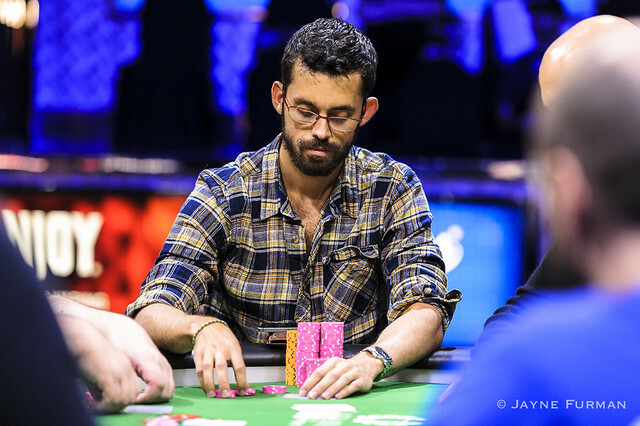 Gorodinsky, a bracelet winner currently residing in San Diego, California, took home $167,517 for his second place finish. Third Place: Adam Owen, Folkstone, UK, finished this event in 3rd place. This marks Owen’s fourth lifetime WSOP and his largest live cash to date. Owen pocketed $104,914 for his efforts. Fourth Place: Mike Leah finished in 4th place. Leah is a WSOP bracelet winner and two-time WSOP Circuit ring winner. Leah earned $75,964 for his fourth place finish, marking his 28th career WSOP cash. Fifth Place: Thomas Keller, from Scottsville, Arizona, finished in 5th place. Keller is a WSOP bracelet winner and has $969,623 in lifetime WSOP earnings. This event makes for Keller’s tenth overall WSOP cash. Sixth Place: Jyri Merivirta finished in 6th place. Merivita hails from Helsinki. This cash marks his fourth career WSOP cash, picking up $47,344 for his efforts. Seventh Place: Stephen Chidwick, hailing from Deal, United Kingdom, finished in 7th place. Chidwick earned $38,447 for his cash today, allowing for his 31st WSOP cash. Eighth Place: Brandon Shack-Harris finished in 8th place. Shack-Harris, who won his first WSOP bracelet in 2014, earned his career 14th WSOP cash with this finish. He’s earned $1,592,367 in lifetime winnings at the WSOP. There were 17 total WSOP bracelets among the competitors at the official final table. Thirteen of those belong to Phil Hellmuth. This was Brandon Shack-Harris’ first cash at the 2015 WSOP. Shack-Harris is coming off of a stellar run in 2014 where he won his first bracelet and was in contention to win Player of the Year. Shaun Deeb, fresh off of his first WSOP bracelet win in $10,000 Pot-Limit Hold’em Championship, just missed out on making back-to-back official final tables. Deeb finished in 9th place, bubbling the official final table for $26,557. Mike Gorodinsky brings it in with a , and Phil Hellmuth calls with a . 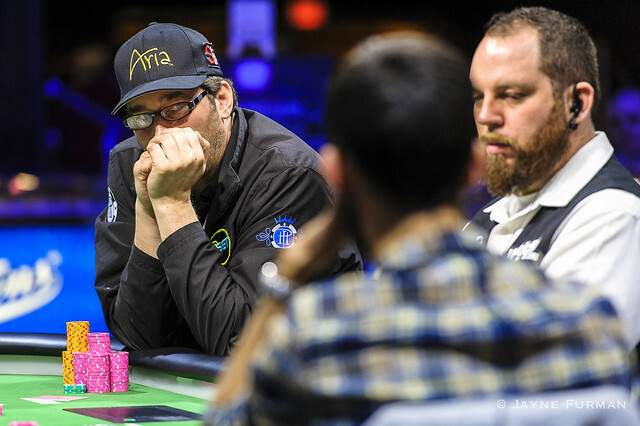 On fourth street, Gorodinsky makes the first bet of 60,000, and Hellmuth raises to 120,000. Gorodinsky ends up getting the rest of his 265,000 chips in right there, and the down-cards are turned up. By the time the last card is dealt face-down, Hellmuth has a made ten-low, and Gorodinsky is still drawing to his. As is typically the case, the big stack (Hellmuth) turns his card over first. It's an , improving him to a seven-low. Gorodinsky is drawing stone dead to his own river, and he's been eliminated. The two men stand to a loud ovation, and Hellmuth puts his hand on Gorodinsky's shoulder, leaning in close to say a few quiet words. The two shake hands, and Gorodinsky steps off the stage as the runner-up, earning $167,517. Didn't run so hot HU but so it goes. @phil_hellmuth played well and hat's off to him, congratulations. Once again, Phil Hellmuth is a WSOP champion. He wins this $10,000 Razz Championship, claiming his 14th career gold bracelet and the $271,105 top prize. Phil Hellmuth brings it in with a , and Mike Gorodinsky moves all in for 55,000 with a .
Gorodinsky's board runs out well, securing his double up one card early. Hellmuth has a made ten-low, and his river is no help. Gorodinsky is still drawing, and a miss on seventh will end his tournament life. He squeezes out a fine looking , though, doubling up again. Mike Gorodinsky brings it in with and Phil Hellmuth completes with . 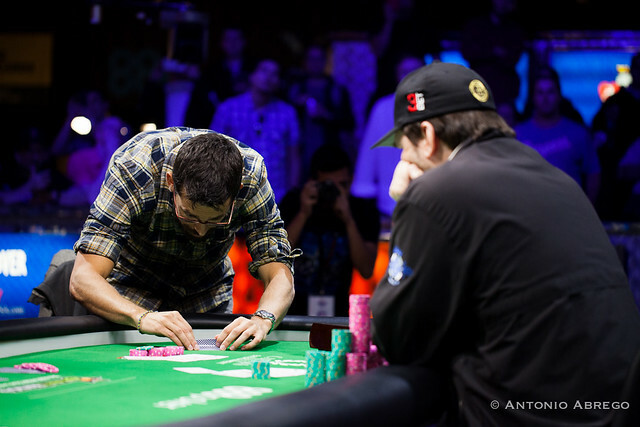 Gorodinsky calls and hits on fourth, while Hellmuth hits a king. Gorodinsky bets and Hellmuth calls. On fifth, Gorodinsky catches and Hellmuth catches . Gorodinsky bets 120,000 and Hellmuth raises to 240,000. Gorodinsky calls and they finish their boards on sixth street. On sixth, Gorodinsky bets 120,000 and Hellmuth calls. Gorodinsky checks on the river and Hellmuth fires 120,000. Gorodinsky check-calls and Hellmuth shows in the hole, good for a 7-5-4-3-A and Gorodinsky flashes in the hole, good for a 7-6-4-3-2. Hellmuth collects the pot and leaves Gorodinsky with less than one big bet. Phil Hellmuth brings it in with and Mike Gorodinsky completes to 60,000 with . Hellmuth makes it 120,000 and Gorodinsky calls. Gorodinsky catches and Hellmuth catches . Gorodinsky bets and Hellmuth calls. On fifth, Hellmuth catches and Gorodinsky catches . Gorodinsky bets and Hellmuth calls again. Gorodinsky bets 120,000 on sixth and Hellmuth calls. Gorodinsky checks on the river and Hellmuth bets. Gorodinsky goes into the tank and Phil Hellmuth stands up and stares at Gorodinsky. After a minute in the tank, Gorodinsky calls. Hellmuth shows , giving him a 10-7 and Gorodinsky flashes a worse ten-low before mucking his hand. Gorodinsky gets all in with a made jack-low on fifth and a draw to a seven. Hellmuth has a queen-low and a draw to an eight. Gorodinsky makes his seven-low on sixth and has Hellmuth drawing dead after he hits a 10. Gorodinsky doubles up and is right back around the one million chip mark. Mike Gorodinsky brings it in with and Phil Hellmuth completes with . Gorodinsky calls and they head to fourth street. Gorodinsky pairs his seven and Hellmuth hits a queen. Both players check and Gorodinsky hits on fifth, while Hellmuth catches 9x. Hellmuth checks, Gorodinsky bets, and Hellmuth check-raises to 240,000. Gorodinsky calls and their boards are completed on sixth. On sixth, Hellmuth bets 120,000 and Gorodinsky calls. The river is dealt face down and Hellmuth bets 120,000. Gorodinsky flashes a third seven in his hole cards as he folds and Hellmuth exposes in the hole, showing that he made a 6-4-3-2-A and he leaves Gorodinsky with just a few big bets left. Phil Hellmuth brings it in with and Mike Gorodinsky completes with . Hellmuth calls and he catches on fourth street, while Gorodinsky catches . Hellmuth bets and Gorodinsky calls. On fifth street, Hellmuth catches and Gorodinsky gets . Hellmuth bets again and Gorodinsky calls again. Hellmuth catches good on sixth and Gorodinsky catches bad. Hellmuth bets 120,000 and Gorodinsky folds. For two consecutive hands, Phil Hellmuth has complained about the dealer. It doesn't appear to be the mechanics or the gameflow that he's upset about, but rather the luck he's having with this dealer in the box. In the most recent hand, Mike Gorodinsky brings in with a , Phil Hellmuth completes with another , and Gorodinsky makes it two bets for 120,000. Hellmuth calls. 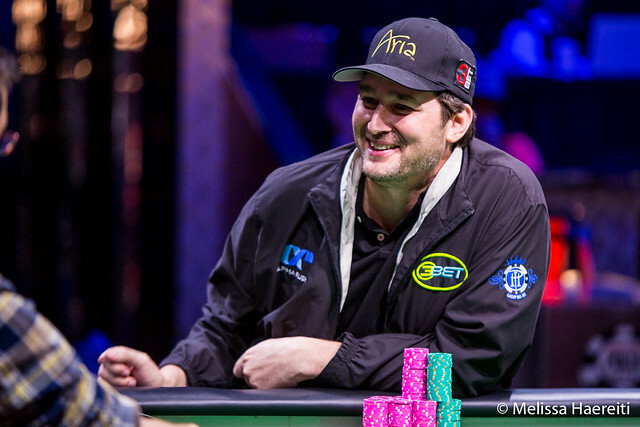 Hellmuth bets his lead on fourth street, with Gorodinsky calling the 50,000. That reverses as Gorodinsky bets his new lead on fifth, and Hellmuth calls the 100,000. As soon as the sixth street card hits the table, Hellmuth shoots a glance backward at the floorman. "You guys have to have the dealers come in on time. You have to follow procedure." Having said his peace, he angrily tucks his cards under and flings them into the muck. Gorodinsky has retaken the chip lead. Mike Gorodinsky brings it in with an , and Phil Hellmuth completes with an . Gorodinsky calls. Hellmuth check-calls 50,000 on fourth street, then another 100,000 on fifth and sixth streets. 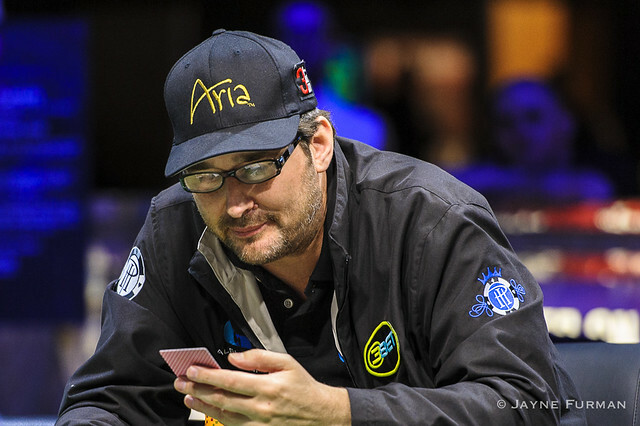 Things get interesting on seventh street as Hellmuth checks for a fourth time. 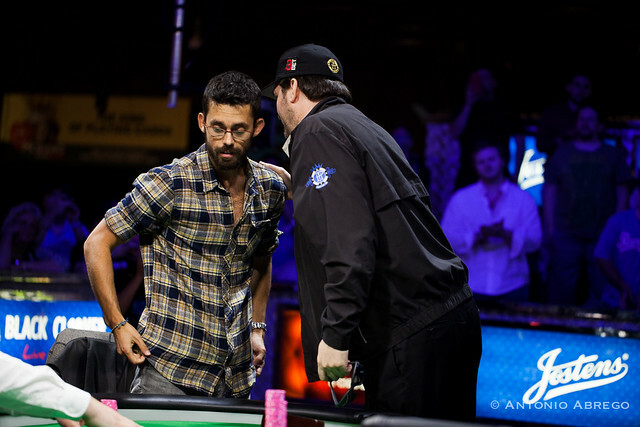 Gorodinsky peeks at his cards and bets it, and Hellmuth is not happy. He slams his face-up, holding a in his hands and mumbling under his breath. "My hand is still live, right?" he asks the floorman, who confirms with a nod. With that, Hellmuth calls with his queen-low. Gorodinsky rolls over for the winning eighty-seven. Mike Gorodinsky brings in with a , and Phil Hellmuth completes with a . Gorodinsky calls. Gorodinsky calls a bet on fourth street, and Hellmuth check to him on fifth. He takes his cue to bet the 100,000, and Hellmuth shows as he folds. Gorodinsky responds by flashing his own , though they were a little more useful for him. 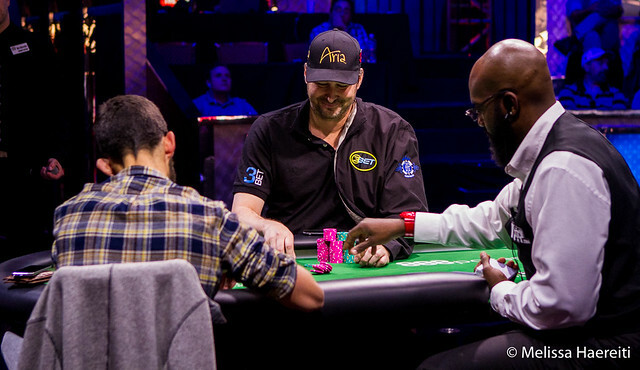 Mike Gorodinsky brings in with a , and Phil Hellmuth completes for 50,000 with an . Gorodinsky raises to 100,000, and Hellmuth calls. Hellmuth's board does not cooperate. He calls one small bet of 50,000 on fourth street, but folds for a big bet on fifth. Mike Gorodinsky brings in with a , Phil Hellmuth completes with a , and Gorodinsky calls. Hellmuth bets fourth street for 50,000, and Gorodinsky calls. Fifth street goes check-check, and Hellmuth bets 100,000 on sixth. He checks seventh street dark, and Gorodinsky checks behind. Hellmuth shows up for ten-nine, and Gorodinsky can't beat it. He mucks, dropping down to less than seven big bets. Gorodinsky check-calls a bet of 50,000 on fourth street, and Hellmuth checks behind him on fifth. When sixth street lands, Hellmuth bets 100,000 and wins the pot. Mike Gorodinsky is the bring-in with a , and Phil Hellmuth completes with a . Gorodinsky calls. Gorodinsky bets his lead for 50,000 on fourth street, and Hellmuth raises to 100,000. Gorodinsky calls, then leads right back out for 100,000 when Hellmuth pairs on fifth. Hellmuth calls. The pair catches Gorodinsky on sixth street, and now he check-calls a bet. That action repeats on seventh street with Gorodinsky paying off the last 100,000. Hellmuth shows up for a ninety-seven, and Gorodinsky can't beat it. Mike Gorodinsky brings in with an , and Phil Hellmuth completes with a . Gorodinsky calls. Hellmuth check-calls a bet of 50,000 on fourth street, and Gorodinsky checks behind him on fifth. On sixth, Hellmuth leads out with a bet of 100,000, and Gorodinsky calls. Seventh street goes check-check. "Queen," Hellmuth announces, but Gorodinsky can beat that. He rolls over for a ten-low to win the pot and retake the chip lead. Just barely, though, as the two men once again find themselves in a dead heat. Phil Hellmuth brings in with an , Mike Gorodinsky completes to 50,000, and Hellmuth makes it two bets for 100,000 total. Gorodinsky calls. Hellmuth calls a Gorodinsky bet on fourth street, but he folds for another one on fifth. Mike Gorodinsky brings it in with a , Phil Hellmuth completes with a , and Gorodinsky calls. Hellmuth leads the betting on fourth street for 50,000, and again on fifth street for 100,000. Gorodinsky calls both bets, picking up the lead on sixth. He check-calls a big bet there, then one final bet on seventh street as Hellmuth barrels through the board. At showdown, Hellmuth opens up , winning the pot with a seventy-six. The counts are now exactly reversed from where the heads-up match began. Phil Hellmuth brings in with a , Mike Gorodinsky completes to 50,000 with a , and Hellmuth calls. Gorodinsky check-calls a small bet of 50,000 on fourth street, but he check-folds to the 100,000 on fifth. With that pot, Hellmuth has taken a very slight chip lead, although the two are essentially dead even.